Everyone repeats clothes at some point (even celebrities who probably have more clothes than they could ever possibly wear). In my quest to try and get more use from my wardrobe, I try to wear things a little differently now and then. Instead of completely repeating an outfit piece by piece, I'll take elements I loved and use it to come up with an outfit formula to follow to wear the same thing slightly differently. Like everyone else though, sometimes you just have to repeat an entire outfit head-to-toe! When I saw these olive embroidered shorts, I instantly thought of wearing them with stripes. I decided to wear them with my foil striped tee, and loved it so much the next time I wore them I picked another striped tee. Same formula, slightly different results. Delayed posting aside, I really liked this outfit! I wore this for our playgroup Christmas party which I overly shared on Insta stories. I've been going to this playgroup since Toddler T was a baby, he had his first Christmas party there and I always go snap happy taking tons of photos of the boys enjoying the massive picnic spread. There were chocolate eclairs this time, and so of course I have a fair few chocolate face photos! I thought the metallic foil stripes on the tee and the Christmas bow on my wrist were nice nods to the Christmas theme without getting too dressed up, as there would be a lot of sitting on the ground and running around with toddlers. I did dress the boys up in their novelty Christmas tees though! Last worn: metallic stripe tee, olive embroidered shorts, studded sandals, Rebecca Minkoff metallic mini MAC bag. Other ways to wear: metallic stripe tee and floral kimono, olive embroidered shorts and black tee, studded sandals and maxi dress, Rebecca Minkoff metallic mini MAC bag and denim jacket. Perfect for pregnancy: studded sandals and maternity shorts, silver mini MAC and maternity denim. I liked the first metallic stripe tee outfit so much that I planned this one, again with the same shoes, although a different Rebecca Minkoff bag. I liked this resulting outfit much I wore it twice! Wore it on Monday, for some errands and a specialist appointment and then again a couple days later on the Wednesday. There was a bit of a stressful day or so in between with an unexpected overnight hospital stay for the little one, and some frantic rescheduling of planned appointments and work for me so that Baby Boy was taken care of. To make things easier on myself, I just pulled on Monday's outfit again. Another doctor's appointment but also the opportunity to work from home while my mother in law looked after baby boy. An outfit formula is a wonderful way to make getting dressed easy, but there is nothing easier than repeating an entire outfit when you're too stressed to think of anything else! Crazy backstory aside, I did enjoy wearing this outfit. 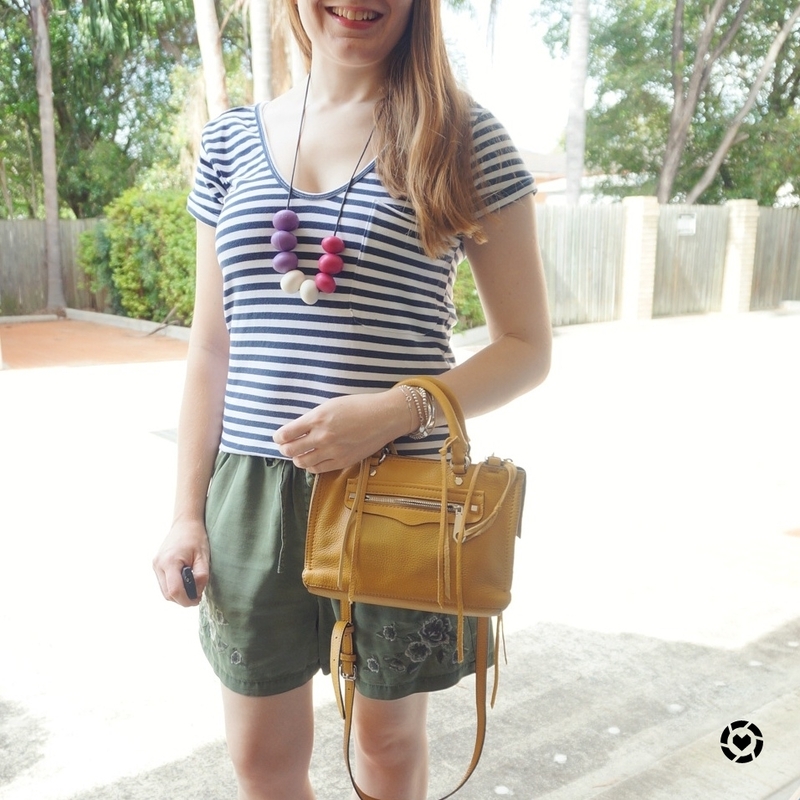 Nothing really matches, with the navy stripe tee, olive floral embroidered shorts and mustard bag, but I do love the way all of the colours work together. Last worn: navy stripe tee, olive embroidered shorts (above), studded sandals (above), Rebecca Minkoff micro Regan bag. Other ways to wear: navy stripe tee and chambray skirt, olive embroidered shorts and floral kimono, studded sandals and a dress, Rebecca Minkoff micro Regan bag worn 30 ways. Perfect for pregnancy: studded sandals in second trimester, stripe tee in third trimester. Nothing wrong with repeating an outfit combination you love! But if you want to change things up a little, try using the pieces that you loved from the outfit to make up a formula to follow to recreate a similar one with different pieces. This also works if you're inspired by an outfit you see but don't have the exact pieces in your wardrobe - identify what you liked about the outfit and see if you could create something similar based on that formula. Outfit formulas work well when you're pushed for time in the mornings too. You can use an outfit you loved for inspiration for a quick outfit another day, just by following the formula you create. I really love both bags you got here. And the striped shirts - I'm obsessed with striped shirts. Love your beautiful outfit, great combo as well, all perfectly match. Thank you for sharing, you look stunning!!! Such a cute casual look :) Happy New Year Dear! As usual, I loved the bags and accessories and you always look beautiful! I agree with you, there's nothing wrong in repeating clothes and for this year I decided to repeat clothes. I am thinking of the excess we live in and the many people who don't have enough to live and I feel ashamed for ditching something I wore only once. So that is one of my new year's resolutions :) I am not such a fan of that, but I feel it is a good one now :) Well done for the post! I repeat outfits all of the time! I'm actually really bad and mixing it up, that's something I need to work on this year! I also can't wait for some warmth to come back our way, your sunny and warm pictures make me want summer! whoops... Happy New Year to you and your family! I really like the color of those shorts! The olive green is so flattering! I also like the relaxed fit. Makes it so much more comfortable! I love the striped tee so much! Very casual and yet chic, my friend! Hope you had a brilliant Christmas celebration, Mica and happy new year to you and family! I love that olive shorts, actually I adore anythign olive shade and you paired it really well with striped tops! Thanks! I want to wear these shorts with stripes again, it's such a good combo! I love how you always say that ;D "nothing really matches, but it somehow fits" lol. I actually love the silver stripe with the green shorts-- they pair so well together. Have you ever thought of a black striped tank with the green shorts Mica? Or too basic for you? I agree, everyone repeats outfits and I think that's what clothing is for ... to be worn. I like the elements of your outfits. The foiled Tee and shorts are lovely. Happy New Year! Hahaha I can not imagine having a wardrobe so big I don't know what I have. For the rest of us it is all about mix and matching and repurposing. You did an excellent job styling these shorts multiple ways. So warm there! Here it is 13 degrees farenheit. It would be cool to have the wardrobe of a celebrity for a bit, but yes, I much prefer knowing what I have, haha! Those shorts are so cute! I love the olive green color, which is sure to pair well with so much; I love the outfits you've created with them! Also, how cute is that bow Christmas bracelet?! Adorable. Thanks for sharing and have a great day! I seriously love the way you recycle outfits - it's very real but always stylish! I love your second look with the bolder stripes! It's an outfit worth repeating I think! You can never go wrong with stripes and I love those olive shorts. I hope baby boy is doing better--poor thing!! Thanks Shea. He's doing much better, he had such a tough year health-wise last year! You look so cute! I am definitely wishing it was summer over here lol! Great looks! I love striped t-shirts and believe that a woman can never have enough of them! I wish you all the best for 2018! Love the color and embroidery on the shorts! haha yes I'm loving the extra posts built up, can't believe I used to blog every day, wow! Absolutely nothing wrong with repeating elements you like in an outfit, and it's great to have those combos to fall back on when life is throwing crazy things at you. Your poor dear Baby Boy has had a very rough go of it, hasn't he? Hugs to you, sweetheart, and good vibes to you and your family. Happy New Year dear, love your outfit. Hi! Pray your sweet baby is doing well! 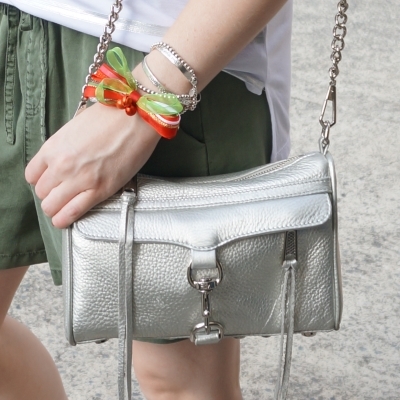 I love the olive shorts and it compliments perfectly with the metallic bag and stripe shirt. Very cute looks. Thanks Tiff! He was only sick for a few weeks thankfully, and was better in time for Christmas. Such a cool casual look. And yes it's fine to repeat outfits! I plan on reshooting old looks this weekend! These shorts looks so comfy! Love 'em, babe! I do love your shorts (khaki is a favourite colour of mine) and I think they look fab with the silver stripes and the silver bag. I really love anything metallic, so of course I love that foil striped tee! Olive is such a great versatile color and it works so well with these two different striped tops. I repeat my outfits all the time, no shame in that. I should probably try and add a few more accessories though, to keep things interesting. Stripes work so well with those shorts! No wonder you keep reaching for them! While the navy striped tee doesn't 'match' it definitely compliments everything else. That is one thing I LOVE about the color blue! It compliments virtually every other color! I hope baby boy is doing better now! I often rewear outfits, even a few days apart if I love them. My hubby got me some leather leggings for Christmas that I wore 3 days in a row! Yes, I'm all about rewearing! :) And thank you, baby boy is doing better. I always love stripes with anything, so this is no exception!! And the yellow purse is my favorite!! Such a cute bag! Rebecca Minkoff is one of my favorites! I'm a big fan of anything with stripes, and often run out of ways to wear them. Pairing with olive is a great idea. I hope things keep getting better for baby boy in 2018 with no more scary hospital visits! Thanks Rachel, I'm hoping that too! That is a cute shorts Mica. You look fresh for 2018. It's a shame I don't have a white button down to give that a try! Thanks all for your comments - and good wishes for baby boy! Those shorts look so comfortable! I wish it was warm enough to wear now in the United States but instead we are looking at snow storm now haha. I shall live vicariously through you as you experience summer these next following months! I totally agree with you, nothing wrong with repeating a good outfit. We can always mix things up a little bit by wearing it with different accessories. I love striped tees btw! my fav thing to wear in the summer. I love the bags, and I love how you simple outfits with accessories. So cute dear. When I look back at a typical wok week, I am SO guilty in repeating outfits. Not necessarily the items themselves, but the basic, overall look. I made a joke to my husband that I needed to keep a log in my phone of what I wore each day because I literally can't remember two days ago. lol In the winter, my chunky sweaters, skinny jeans and basic v necks are on repeat. It's what I've worn 3 out of 3 days this week so far. (; Like you said, even celebs do it! Mica your silver RM bag is lovely! I think it adds such a cool element to the overall outfit. I love it! And I of course love the mustard one as you know! I'm enjoying your summery outfits lately! That's a really great idea! I like the second outfit more but both are pretty.